Many owners of third party firewalls such as Norton Internet Security and Zone Alarm, which filter access between computers by zones, are used to the idea that personal firewall settings can affect the ability of various computers on their local network to be accessed from other computers. Recent changes to Internet Explorer may also have an effect on how your computers, on your local network, are accessed from each other. If you use My Network Places (aka Network in Windows Vista), you may be accustomed to seeing all computers on your local network listed with a Network Location of "Local Network". Some owners of computers running Microsoft Windows are reporting that local shares now list with a Network Location of "Internet". It appears that this oddity can be controlled through the (Internet Options - Security - ) Local Intranet - Sites wizard in Control Panel. 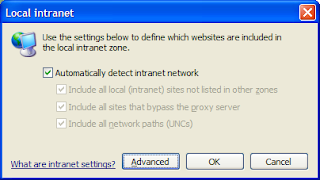 This is the default setting, causing local computers to be listed as "Internet". 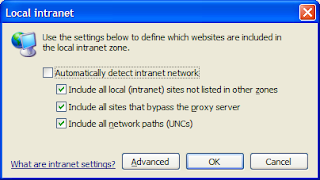 This is the currently effective setting, causing local computers to be listed as "Local Network". This behaviour appears to be independent of the status of Windows Firewall. It's quite likely that this will affect more than just the display of the various computers in My Network Places.